At the industry level, a consolidation process has taken place in the last four years. Four years ago, 25 % of the beef slaughter was in the hands of three companies. Have taken their operations overseas and both companies have considerable stakes in the beef (and poultry) markets on a global basis. On the domestic front, the last few years has been characterized by a number of companies going out of business or entering chapter 11.These trends – both at the industry and at the livestock level – will be described and analyzed in this report. In considering the supply of live animals and the need to improve commercial relationships with industry, case examples will be given which will indicate the increasing or decreasing level of integration in the beef chain and the gradually growing importance of feedlot operations. 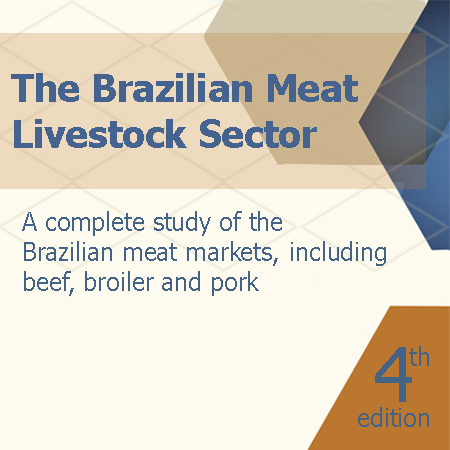 This will be the 4th edition of the Brazilian Meat & Livestock Report. The report is currently under development and will be delivered to clients in mid-July 2015.